This is a practical guide which will help you to use Ichimoku in your trading. Ichimoku Kinko Hyo is a Japanese investing technique. It provides all – trading signals, resistance and support levels. It is very different from normal western techniques such as trading with moving averages, but after a while you should understand it easily. It was created around 50 years ago by Japanese journalist Goichi Hosoda. He started to work on Ichimoku before World War II. To the West, this technique is know from 90s, just like candles it was unknown for many decades. Usually, we look for support or resistance right at moving average or support line. 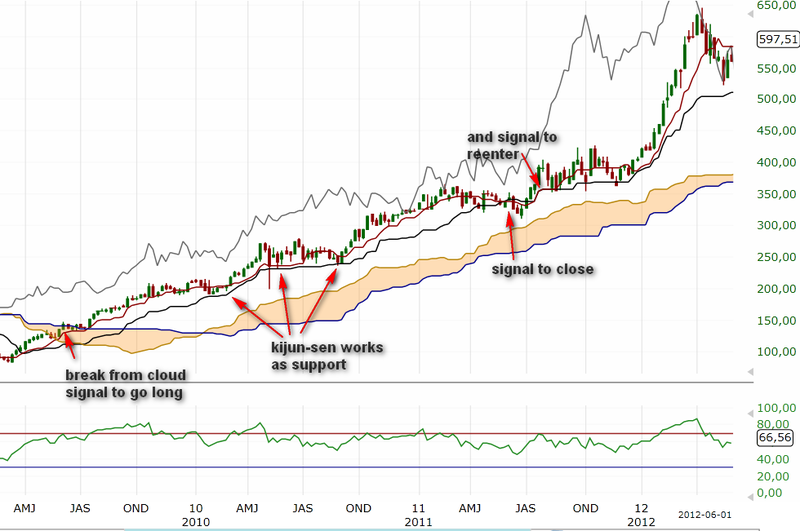 Ichimoku cloud is different – it is area of possible resistance or support. The thicker cloud is, the stronger resistance or support should be at this place. 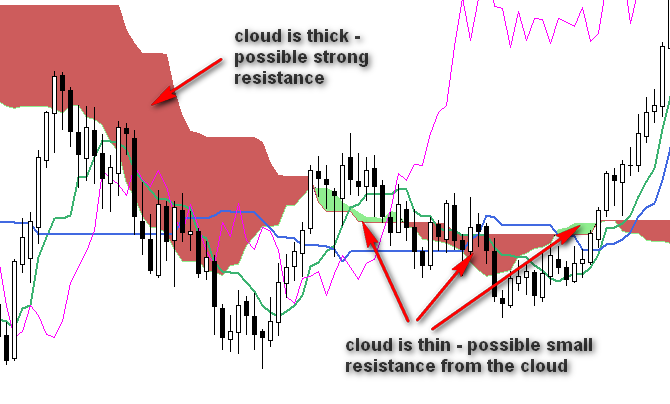 If cloud is thin, than possible support/resistance should be weak. When price manage to break out or break down from cloud, then this is a strong signal to take position, because it happens rarely. There is one more interesting thing about cloud. It is shifted forward, this part is called future kumo. 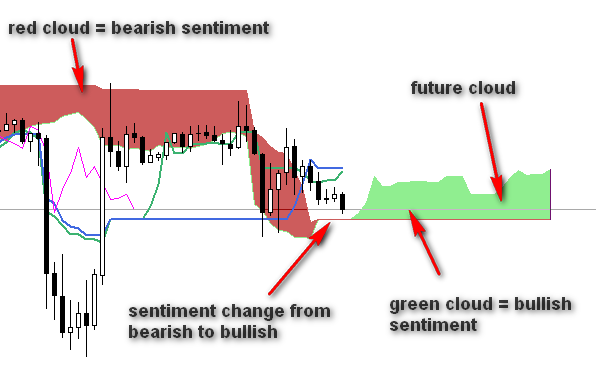 When future kumo changes color from red to green, then there is a shift in sentiment. Cloud has two colors – one (usually red) when the sentiment is bearish, and second (most often green) when sentiment is bullish. As you can see, it acts different. From my experience, I can say that Kijun Sen itself is a good resistance/support level. The main idea behind Chikou Span is that it helps to compare current price with price from 26 periods before. The end of Chikou Span is the current price close. Based on that we know if the current sentiment is bullish (Chikou Span above price) or bearish (Chikou Span below price). 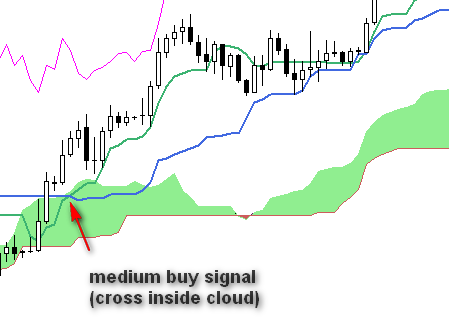 So this is another Ichimoku component which helps us to determine current sentiment, the previous one was Kumo. 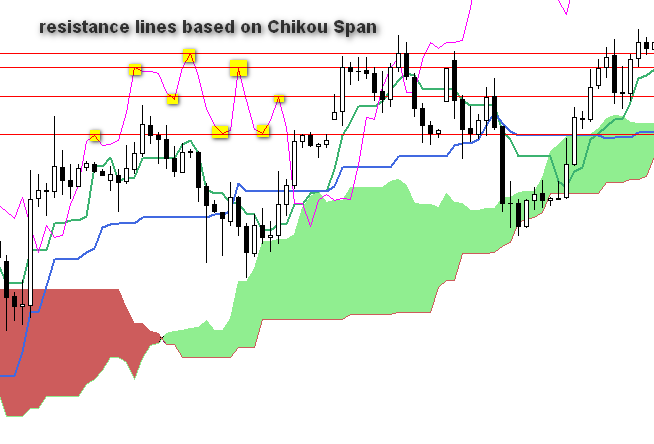 Chikou Span is following current price and it has highs and lows because that is the way price move. We can use that points to draw support and resistance lines. Is this better than standard support and resistance lines? To be honest, not so much. You can stick with standard support/resistance levels and you will be good. Just wanted to show you that this is another possible way of using Chikou Span. First, one thing need to be explained. Ichimoku Kinko Hyo gives you picture of current situation at markets. It also comes with sets of trading signals. That does not mean that you have to stick to these signals. 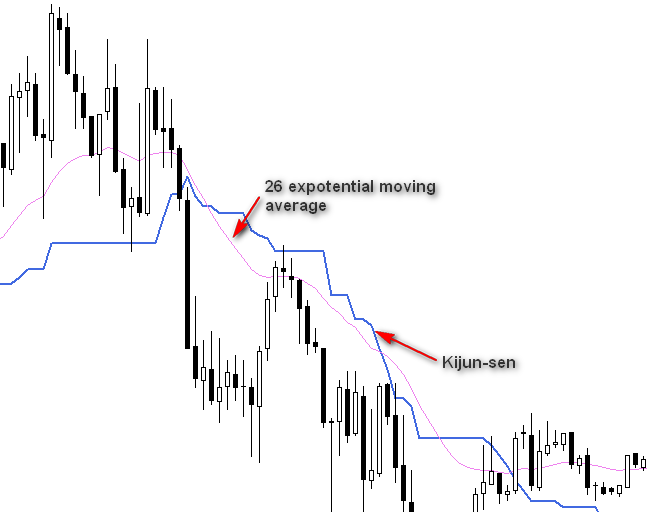 You can use Ichimoku as a base to build your own trading system. That’s what I did and from what I know, many other traders. This is a first signal we can take. 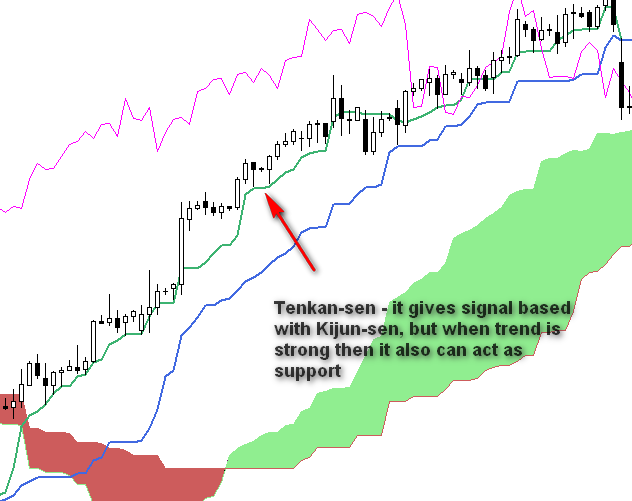 When shorter average Tenkan crosses with Kijun from the bottom, then this is a buy signal. There are three types of buy signal: weak, medium, strong. That make sense. 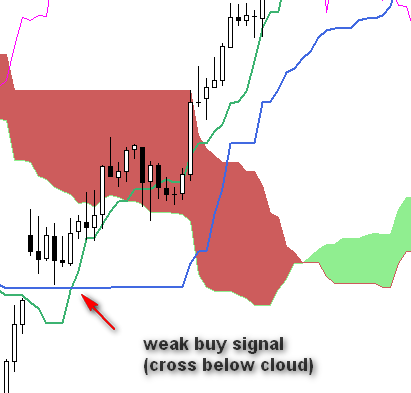 When buy signal occurs below cloud, that means that resistance area is above so sentiment is more bearish at the moment. 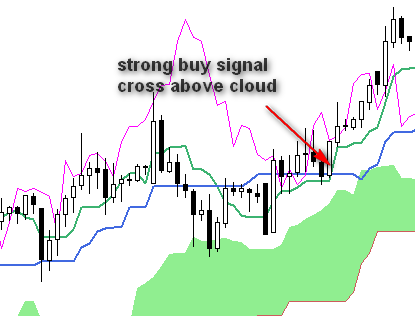 When buy signal occurs above cloud, then sentiment is bullish, there is no strong resistance above. Similar situation is with sell signal (signal to take short position). There are three types of sell signal: weak, medium, strong. When you take signals based on cross of Tenkan Sen and Kijun Sen, then you may want to wait for confirmation from Chikou Span. This is optional, and many traders do not use this that way. Let’s say that there is a buy signal from Kijun and Tenkan Sen. Then we wait for confirmation from Chikou Span – so the moment when Chikou Span will cross the price. This is my favorite signal to take position. By now you know that cloud acts as a support when price is above Ichimoku cloud and as resistance when price is below cloud. It is not that often when price changes sides. When it happens, then it is a sign that there is a shift in sentiment. 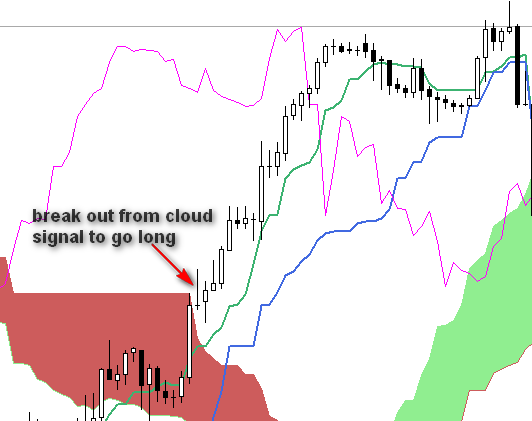 When price is below cloud and it breaks up, then it is a signal to take long position. When price is above cloud and it breaks down from the cloud, then it is signal to go short. The good idea is to place stop loss on the other side of cloud. 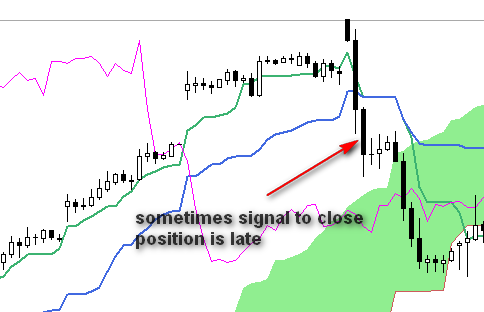 This signal may be very effective – check how it works on weekly time frame. Of course it works also on lower time frames. Another signal to take position. 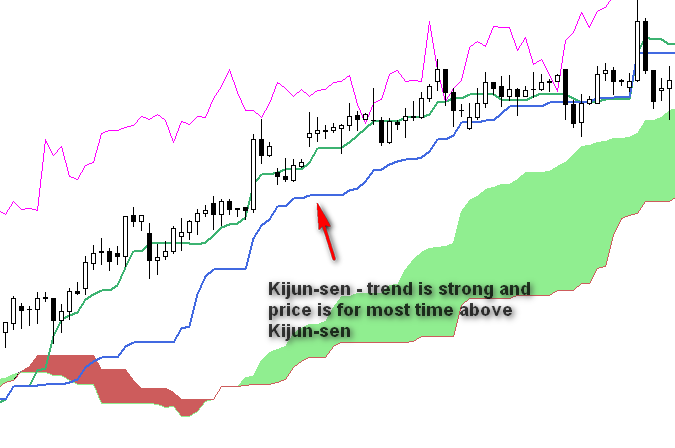 Kijun Sen is longer average and when price break above Kijun Sen, then this may be signal to buy. When it breaks below Kijun, then this is a sell. It is similar to normal averages – when price breaks above 50 or 200 moving average, then many traders go long. You will notice fast that this signal is very slow. When the move ends, there is often strong sell off and you may lose most of your profit. Is there a better way? Exit trade when price close on the other side of Kijun sen.
Exit trade when price closes below recent low (in an uptrend). So basically, you are rising your stop loss every time new low is made. 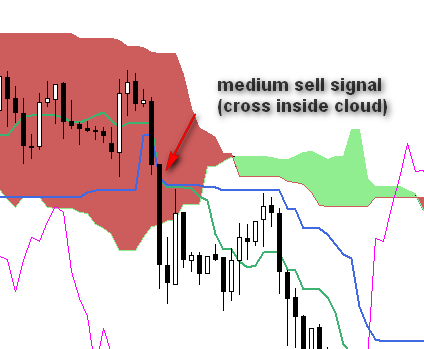 Join Ichimoku with oscillator and close based on signal from it. Check examples to see how it works in practice. 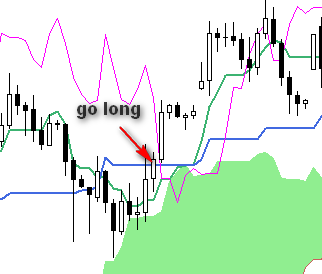 Ichimoku Kinko Hyo works on every time frame. 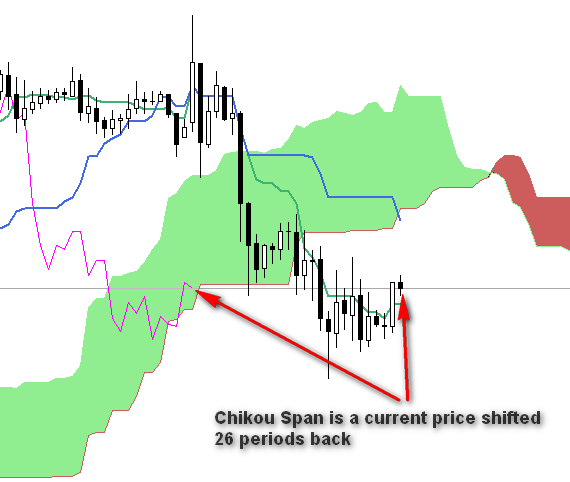 In my opinion, on lower time frames Ichimoku is less accurate. It is because on lower time frames moves are more rapid. On lower times automated trading is very popular, but it affects the way price move. On the other hand it does not mean that there are no trends on lower time frames and where we have trends, there we can trade with Ichimoku. You have to test what time frames works best for you. I have very good results with longer time frames, even as long as weekly and monthly. Let’s look at weekly Apple chart. We know now that Apple is in very strong uptrend since 2009, but it wasn’t that clear few years back. How does it look on weekly chart? We can see that there was a breakout from cloud. In years 2006-1014 breakout from cloud took place only six times. If you followed this signal in 2009, you could make some serious money. This is a good example that Ichimoku is great to catch big trends. On higher time frames situation is clearer, so it is a good idea to test what signals we can get from higher time frames. Same as with time frame, Ichimoku works on every kind of market. It does not matter if you trade stocks, Forex, or commodities. 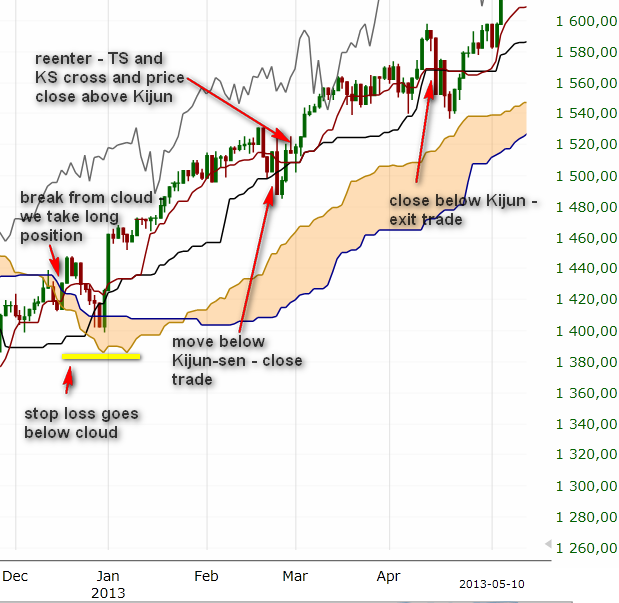 If you have a chart and you can spot trends, then it is a good place to try Ichimoku. 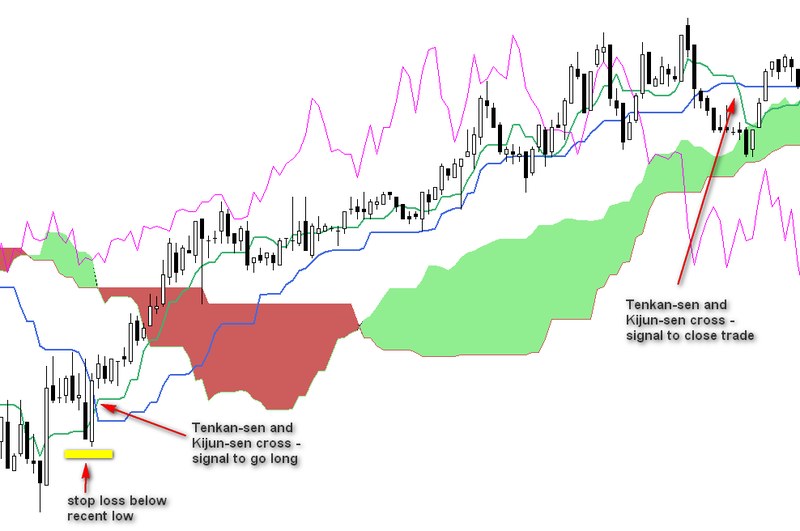 Examples below show different ways of trading with Ichimoku. Test it in practice and choose the best for you. 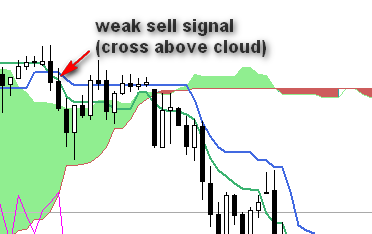 On daily SP500 chart we saw a break out from cloud. 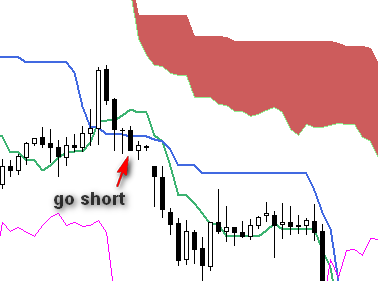 We took long position and placed stop loss below cloud. After some problems in the beginning, trends got stronger. We moved our stop loss below Kijun-sen. Decision is that we close trade as soon as there is a close below Kijun-Sen which happened in the end of February. Few days later there was a signal to reenter a trade – price moved back above Kijun-sen and there was a cross of Kijun-sen and Tenkan-sen. We took long position. Again, trade should be closed when price will close below Kijun-sen.
On this eurusd 5 minute chart we wait for Tenkan-sen and Kijun-sen cross. When it happened, it was time to take long position with tight stop loss right below recent low. We planned to close trade after another Tenkan and Kijun-sen cross which happened after nice move up. Hakim de Bordeaux - France. thanx a million. very useful. appreciate the attitude to help other people make money. 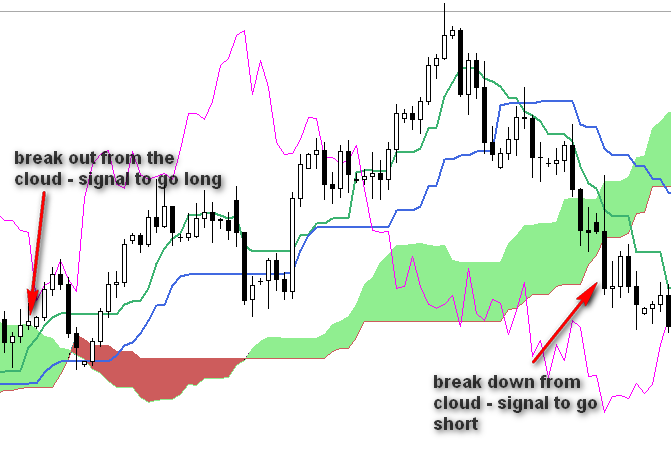 where I can get the Ichimoku Kinko Hyo Indicator / EA ? It looks interesting to try. It is rather popular indicator and it should be built in your trading platform. If you can't find it try to google "ichimoku + name of your trading platform". If you will still have problems, contact with me and I will try to help. At the outset I must Appreciate your time and effort for writing this fine article it shows you are really tech savvy. 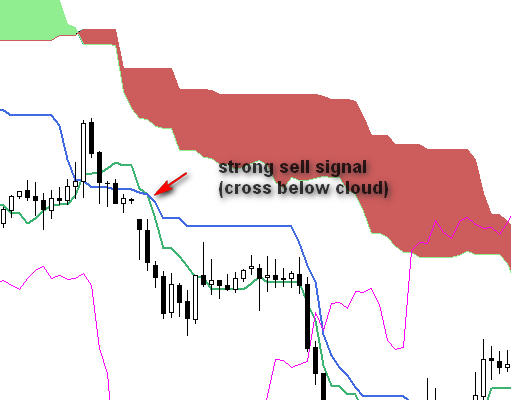 Please tell me few sites which offers to practice trading with ichimoku on chart freely i.e as a paper trading. It repaint the signal - any way to solve it? No. It is working like moving average. Signal can change until price is close. You can simply wait for close. if we put a small time frame, do we still need to confirm a larger time frame? what if the Ichimoku for scalping does this work? I personally don't think that Ichimoku is good for scalping on lower TF, you have to test it by yourself. Maybe you can build a good trading plan around it. Hi Simon, Thanks a lot. 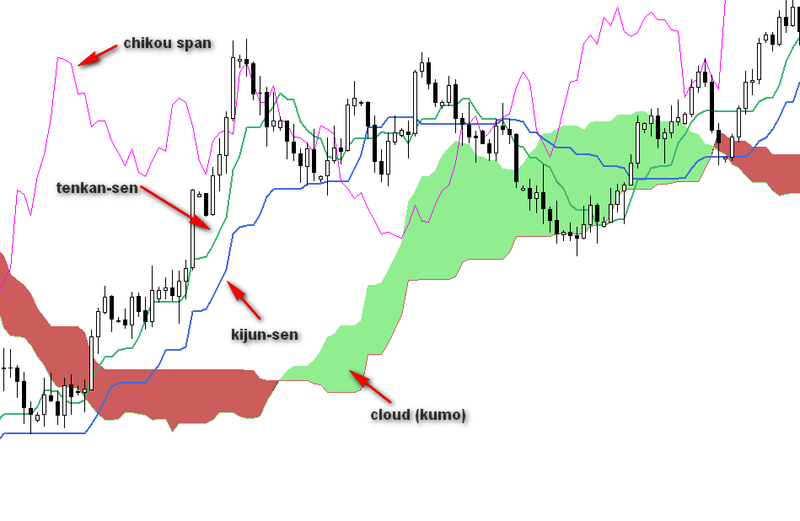 Hard to find details abt Ichimoku in simple manner. I'm using 1Hour TF in commodities. It works well. 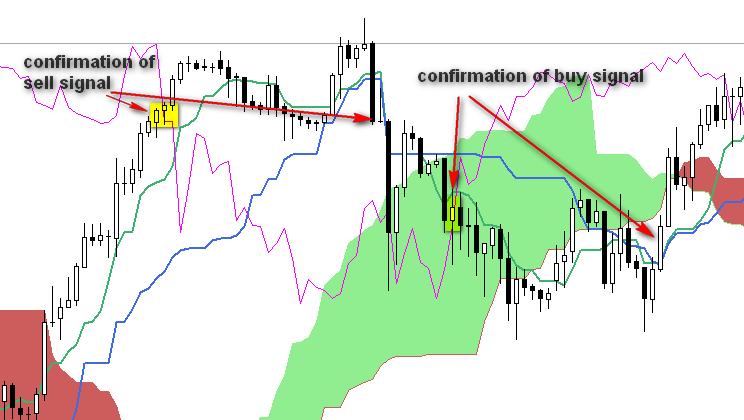 Yes, Ichimoku works best on higher time frames like 1h, 4h, daily... 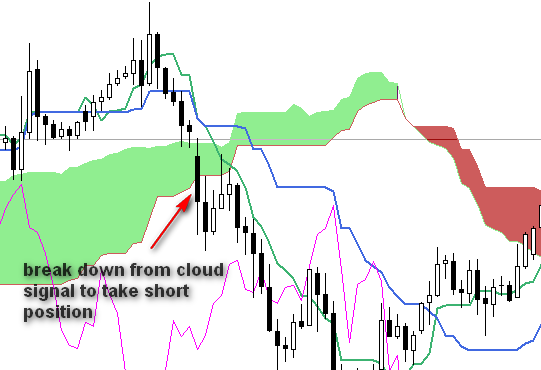 I do not recommend to go lower than 1h with Ichimoku. Which time frame do you use Mr Ichimoku on?